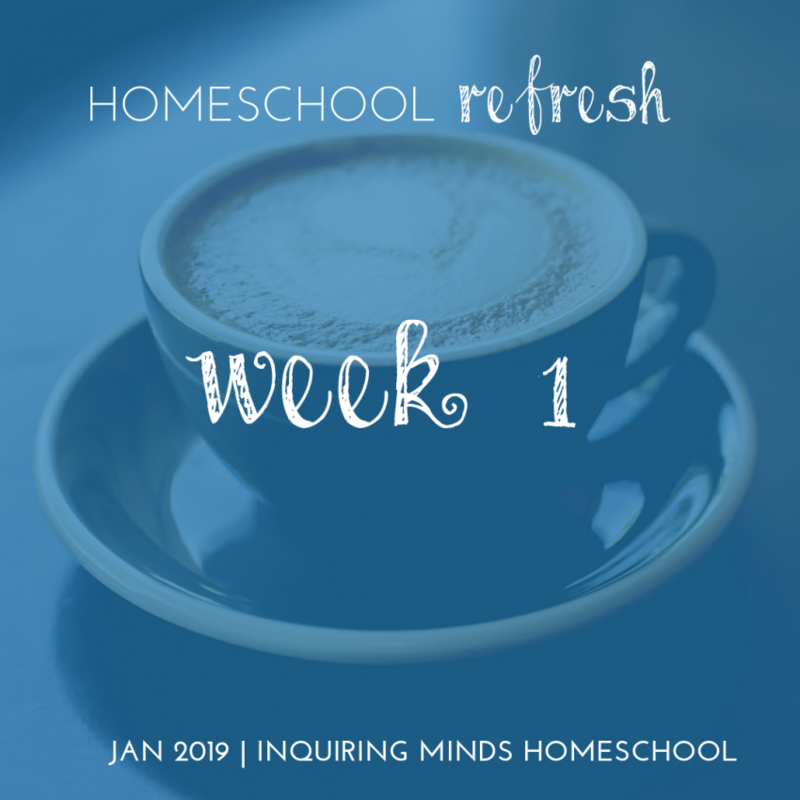 Welcome to the Homeschool Refresh! As 2018 winds down and 2019 begins, many of us set new goals and resolutions. It can be a little overwhelming, to be honest! There’s also the inconvenient fact that resolutions tend to quickly fall by the wayside. 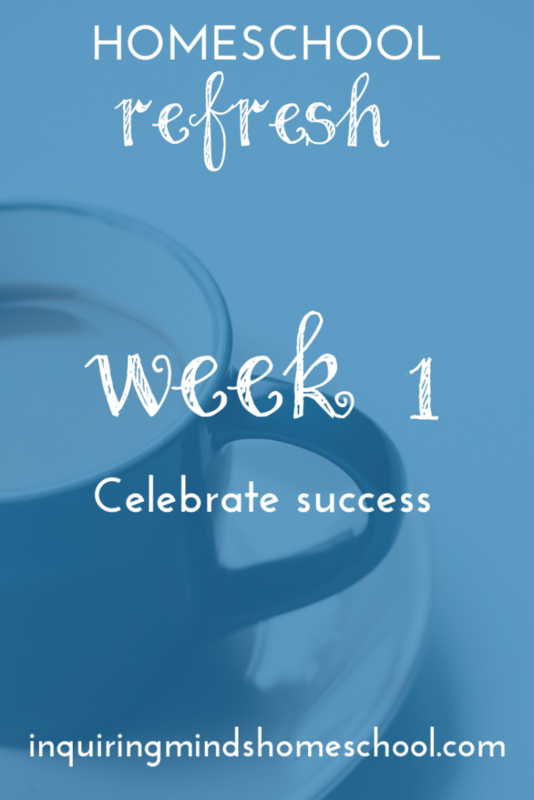 How can we begin the New Year feeling refreshed and ready? Let’s set ourselves up for success! That’s where the Homeschool Refresh comes in. 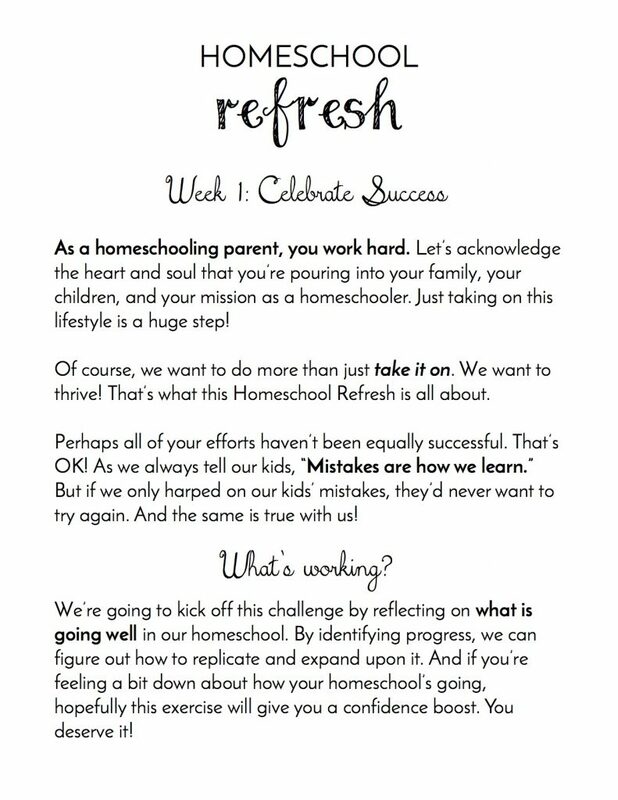 For the next five weeks, I’ll be posting about a new set of printable worksheets that will guide you to refresh your homeschool setup. Whether you’re new to homeschooling or have been involved with it for a while, this is your opportunity to reflect on what is and isn’t working for you. Before we go off making resolutions to change this or that, it’s important to acknowledge what is actually working well! It can be tempting to focus on the negative, but that will zap your energy and make you feel less empowered. Imagine how it would be if you tried to help your kids learn by constantly criticizing them and focusing on all the mistakes they made. Their morale would plummet through the floor! So we say “That’s a good start” or “I liked the part where you did X”. Do you want to download the free booklet for this week? Click the image! Let’s extend the same kindness to ourselves. There will be plenty of time to think about what we want to improve. I personally have so many things that I want to be better about! But I don’t want to get discouraged and give up before I even get started. So instead, let’s celebrate success! 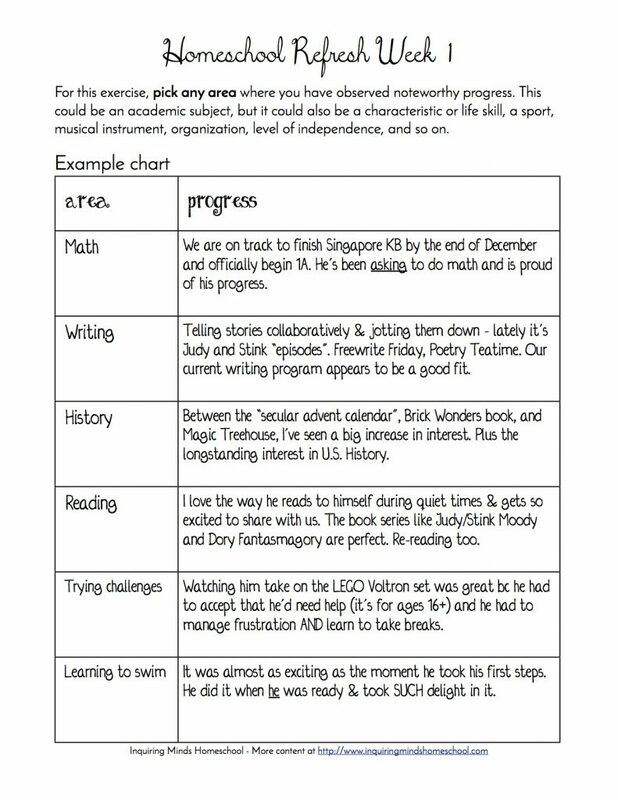 What I’d like to offer for you is a printable chart (or you can fill it out right on your computer – it’s a fillable PDF as well). You can identify some areas where you’d like to celebrate the successes in your homeschool. Maybe your child learned to read this year. Maybe she finally cracked those multiplication tables. Your child might have made beautiful art, found a new best friend, discovered a passion for paleontology, written in a journal for the first time…. Whatever it is, celebrate it! Here’s the chart that I filled out. I first printed it out and wrote in pen, then typed up a version so you wouldn’t have to struggle with my imperfect handwriting! Math – we wrapped up a level of curriculum and are moving on to the next level. The curriculum we’re using (Singapore Dimensions) is a good fit and he’s enjoying it! Reading – this is my son’s preferred way to learn, so he spends a LOT of his free time reading. He gave up his nap this year and has been reading in bed instead. I’ve written a lot about reading on the blog, so you can check that out if you’d like to see how we approach it. Learning to swim – I had no idea this milestone was going to be so exciting! What if I haven’t been homeschooling very long? It’s OK if you are still new to homeschooling and you feel like you don’t have a lot of successes racked up just yet. If you’ve been homeschooling for a month, pick something from the month that you enjoyed! Or you can start by celebrating the fact that you made the decision to start. Many people have told me that they wish they could homeschool. You’re doing it! Here’s what the blank chart looks like. You can get it downloaded to your email when you sign up for the challenge! Once you’ve filled your chart out, what next? The booklet also includes suggestions about how to reflect on your chart as the week progresses. I’d love to see how your charts turn out! You can connect with me on Instagram at @inquiringmindshomeschool. 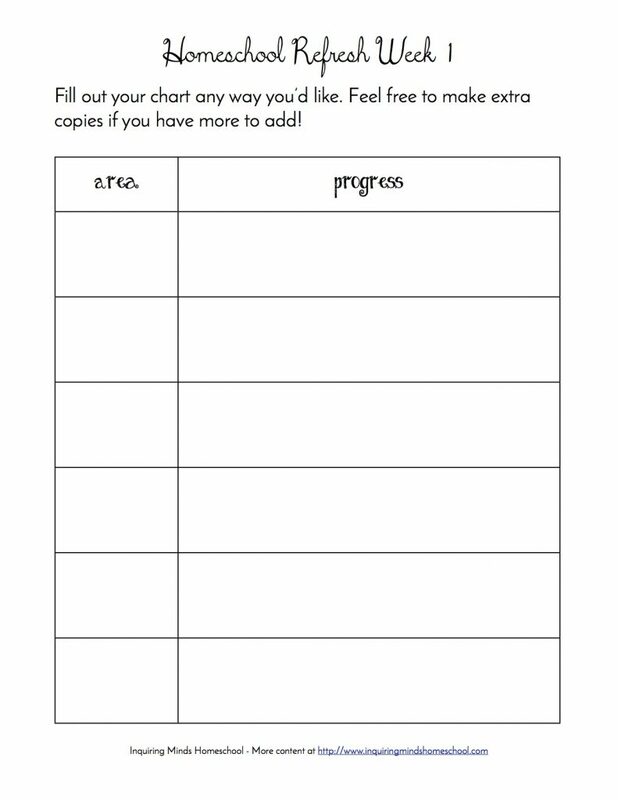 If you feel comfortable, post your finished chart & tag me! Have a GREAT New Year, everyone! Here’s to a successful 2019 for all of us! Know someone else who’d love a challenge like this? Feel free to pass this on!